Find out about 'Root causes of Thyroid issues & what you can you do test and treat' on The Wellness Directory. Then find a Naturopathy practitioner to help you with Hormone Imbalance, Thyroid Problems. One of the common complaints I get from my patients is that their doctor has diagnosed Hashimoto’s Thyroiditis or sub-clinical or clinical hypothyroid and popped them onto medication with little advice as to what could have caused the issue in the first place and what else they can do to manage or even reverse the condition.This article aims to provide this information. By arming you with the most probable causes you will be better equipped to reduce the symptoms and prevent further (or any) thyroid damage. What is the difference between Hashimoto’s thyroiditis or sub-clinical or clinical hypothyroid? Thyroid hormone disorders can be classified as those resulting in inadequate thyroid hormone production (hypothyroidism) Hashimoto’s causes the immune system to form antibodies against the thyroid gland, resulting in our own immune system attacking our thyroid gland as though it were a foreign invader, like a bacteria or virus. This autoimmune attack eventually leads to hypothyroidism. Common symptoms of hypothyroidism, or thyroid hormone deficiency, include a slowed metabolism, weight gain, forgetfulness, feeling cold or cold intolerance, depression, fatigue, dry skin, constipation, loss of drive, hair loss, muscle cramps, stiffness, joint pain, a loss of the outer third eyebrow, menstrual irregularities, infertility, and weakness. Iodine Deficiency Versus Hashimoto’s When there is a deficiency in the building blocks required to make thyroid hormone (iodide, selenium, zinc, and tyrosine), TSH is triggered to signal additional production of TPO to start converting the stored iodide to a usable form (this also results in hydrogen peroxide production). If no iodide is available, the body will attempt to increase thyroid hormone production by making bigger thyroid cells, thus resulting in an enlarged thyroid gland known as a goitre. Iodine deficiency is the leading cause of hypothyroidism in many underdeveloped countries and can cause both hypothyroidism and goitres. In where iodine is added to salt or other foods – Hashimoto’s is the leading cause of hypothyroidism, not iodine deficiency. Each person with Hashimoto’s will have his or her own combination of these unique root causes. One person may have a food sensitivity to gluten and nutrient deficiencies of selenium and vitamin D and get into remission and become 100% symptom-free by going gluten free and taking some supplements. Another person may have all six root cause types with numerous food sensitivities, infections, toxins, nutrient depletions, stress hormone depletions, and digestive deficiencies. This person has to keep peeling back the layers to reach symptom resolution and remission! 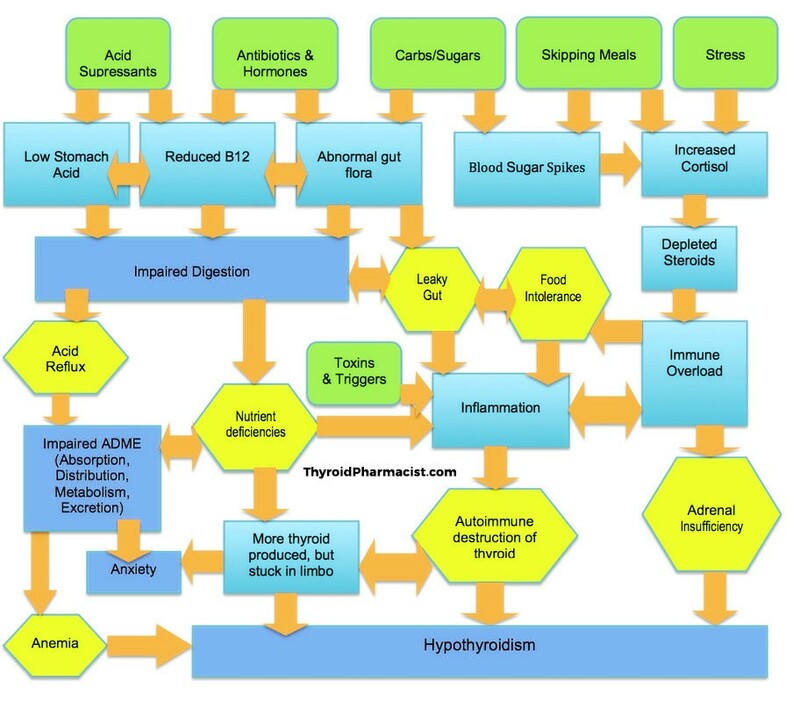 What are the causes of YOUR thyroid issues? Food sensitivities can create a bit of vicious cycle situation. For example, gluten sensitivity can trigger Hashimoto’s and gut permeability which causes us to react to even more foods and further attack our thyroid gland. There are also Type IV delayed hypersensitivity reactions governed by the IgG branch of the immune system—as the name implies, they do not occur right away. In fact, it can take up to 4 days for them to manifest, and this is one of the reasons why it’s so hard for most people to correlate food sensitivities with symptoms. For example, you may eat corn on Monday and have a panic attack on Wednesday! The silver lining? When you eliminate your reactive foods, you eliminate your symptoms (and often the attack on your thyroid!). Testing. The gold standard of food sensitivity testing is the Alcat food and sensitivity test Although this test can be quite expensive I use it a lot as it is so much easier tp scientifically test and know what you are sensitive to that second guess and trial for the next 5 years. I recommend this test for all my thyroid clients. Eating conventionally grown foods, taking medications and having food sensitivities, gut inflammation, poor digestion, malabsorption, gut infection, an altered flora, and even hypothyroidism in itself, can lead to nutrient depletions. Even people who are eating organic, nutrient dense diets are at risk for nutrient deficiencies, as factors like low stomach acid, fat malabsorption, and a deficiency in digestive enzymes will result in many of us not being able to properly break down the nutrients from the foods that we’re eating. This is where supplementation comes in. Thiamine (Vitamin B1) has been found deficient in people with Hashimoto’s and Crohn’s disease. Clues that you may have a thiamine deficiency: having Hashimoto’s or another autoimmune condition; IBS; fatigue; low blood pressure; low stomach acid; feeling worse after drinking alcohol or after taking L-glutamine; brain fog; adrenal or blood sugar issues. More energy, better brain function, stabilised blood pressure and improved blood sugar tolerance. Food sources include beef, liver, dried milk, nuts, oats, oranges, pork, eggs, seeds, legumes, peas and yeast. Selenium deficiency has been recognised as an environmental trigger for Hashimoto’s, and most people with Hashimoto’s are at risk for this deficiency. Less anxiety, better T4 to T3 conversion, lower thyroid antibodies, more energy, less hair loss, fewer palpitations. Brazil nuts. meats, fish, and shellfish are all rich in selenium. Magnesium has often been called the “miracle nutrient,” Magnesium deficiency can cause migraines, headaches, insomnia, menstrual cramps, anxiety, joint pain, and a whole host of other symptoms (like intolerance to loud noises!). Studies show that long-term use can also help with normalising the thyroid gland appearance on ultrasound, and magnesium may also help for thyroid and breast nodules. Reduced anxiety, reduced palpitations, more energy, an improvement on thyroid ultrasound (when used long-term), no more menstrual cramps, relief of constipation, migraines, cramps and pain, better sleep. Ferritin is our iron storage protein, and low levels are commonly associated with Hashimoto’s and may lead to fatigue, difficulty breathing, and big time hair loss (zinc may also be an issue here). Who is at Risk for Deficiency: Women who menstruate and are postpartum may be at increased risk due to blood loss. Additionally, SIBO, H. pylori, low stomach acid, vegan/vegetarian diet, manganese deficiency, and copper and heavy metal toxicity can cause low ferritin levels. Vitamin B12 helps us with our energy production, and low levels are commonly associated with Hashimoto’s and may lead to fatigue, depression, neurological issues, impaired digestion, brain fog, tingling extremities, nerve damage, seizures, and anaemia. Who is at Risk for Deficiency: Vegans and vegetarians are at greatest risk due to the fact that B12 is only found in animal foods and cannot by synthesized by the human body. Those with pernicious anemia (a type of autoimmune condition), H. pylori, and SIBO may also be at risk. Energy, mood enhancementFoods high in Vitamin B12 include shellfish, liver, fish, crab, fortified soy products (tofu, soymilk), fortified cereals, red meat, low fat dairy, cheese, and eggs. Vitamin D deficiency is more commonly found in people with Hashimoto’s and deficiency has been correlated with the presence of antithyroid antibodies. Research done in Turkey found that 92% of Hashimoto’s patients were deficient in vitamin D, and another 2013 study found that low vitamin D levels were associated with higher thyroid antibodies and worse disease prognosis. Vitamin D supplements can improve our mood and can help us reduce thyroid antibodies.Foods that provide vitamin D include oily fish, like tuna, mackerel, and salmon, foods fortified with vitamin D, like some dairy products, orange juice, soy milk, and cereals, beef liver, cheese, egg yolks. The adrenal glands, a pea-sized organ, sitting atop of the kidneys produce hormones that regulate blood pressure, electrolytes balance, blood sugar, immune responses, digestion, and stress responses. Constant unremitting stress, as experienced by nearly everyone in today’s society, hijacks normal hormonal responses, redeploying the adrenals’ resources to combat the “evil” of the moment. The other adrenal functions, digestion, immune response, and thyroid hormone production, are temporarily put on hold or slowed until the stress has passed. In an ideal world, the stress passes quickly, and the adrenals resume their business. In our non-ideal, one stress after another puts the adrenals in overdrive. The body is flooded with cortisol driving the adrenals to handle the stress but eventually cannot keep up. The thyroid is impacted by the constant flooding and eventual depletion of cortisol. High levels signal the brain to lower the production of stressor hormones. Unfortunately, thyroid hormone is produced in the same pathway and is also lowered. The critical step of converting T4 to the usable thyroid hormone free T3 is compromised as stress hormones affect the enzymes that convert T4 to T3 converting T4 into the inert unusable reverse T3. Chronically elevated cortisol levels release inflammatory cells which desensitise thyroid receptors to thyroid hormone. Like diabetics who don’t respond to insulin, you may have adequate thyroid hormone, but inadequate thyroid utilisation. Increased circulatory cortisol increases oestrogen in the blood stream. Oestrogen increases thyroid binding globulin, tying up T3 and T4, reducing hormone levels to achieve the conversion to free T3. Elevated cortisol levels with its’ inherent state of chronic inflammation can trigger “leaky gut syndrome,” latent infections leading and autoimmune diseases. A vicious cycle. By age 10, a child born in the millennial year 2000 is exposed to approximately 80,000 chemicals that did not exist in 1970. Over the past twenty years, the incidence and prevalence of autoimmune diseases have spiked dramatically. Evidence indicates that thousands of chemicals interfere with many metabolic processes in both plants and animals. Mercury, perchlorate and nitrates are chemically similar to the element necessary for T4 thyroid hormone production, iodine. When absorbed, they are mistaken for iodine, leaving the body less iodine to make thyroid hormone, resulting in hypothyroidism. The cells of the thyroid gland (as well as other cells in your body) become inflamed and damaged to the extent that the immune system no longer recognises them as “self”. Antibodies to its’ own thyroid molecules are created resulting in hypothyroid autoimmune disease, Hashimoto’s Thyroiditis. Mercury is found in sushi, cosmetics, vaccines, pesticides, dental fillings, and even coal-fired power plant residue. Perchlorate is present in fireworks, fertiliser and rocket fuel. Nitrates are used in fertiliser and processed or cured meats like hot dogs and bacon. Spinach and celery contain natural nitrates. Skin care products, genetics and dental amalgams can also lead to heavy toxic exposure. Avoiding these toxins is all but impossible. HEPA filters are readily available to clean the air, water quality improves with filters as well. Consuming organic, grass fed meats, fish with lower mercury levels (salmon versus tuna for instance), and avoiding processed and cured meats (or using nitrate-free cured products) reduces nitrate exposure. Liver detoxification is the body’s way of ridding itself of these toxins. Nutraceuticals such as glutathione, the most abundant antioxidant in the body, or N-Acetyl-Cysteine, its’ precursor, along with milk thistle, and Vitamin C may be useful. Similar to gluten and toxic chemicals, infectious agents leave inflamed, damaged thyroid tissue in its’ wake. Again, the body produces antibodies to defend but ultimately attack itself. Infectious agents linked to thyroid disease include Herpes simplex 1 and 2 (causing oral and genital herpes), Epstein-Barr virus (mononucleosis, multiple sclerosis, lupus, chronic fatigue syndrome, and fibromyalgia), Yersinia enterocolitica (food poisoning from uncooked pork, and contaminated meat and dairy), Hepatitis C (blood or body fluids of an infected person), and H. pylori, (a bacteria that attacks the stomach lining creating ulcers). Viral infections are susceptible to Humic Acid-Monolaurin, a free-radical scavenger and natural anti-oxidant. It binds positive and negatively charged ions boosting the immune system, and contains olive leaf a known antiviral, anti-bacterial, and fungal agent. Treatment: The key is to work with your nutritionist and naturopath to provide a diet to optimise immune function as well as eradicate the infections. Herbs and pure essential oils are ideal. While we can’t change our genes, we can reverse the autoimmune condition by removing triggers and intestinal permeability. Dr. Fasano uses the example of Celiac disease to explain this phenomenon. Coeliac disease is a unique autoimmune condition where gluten acts as both the trigger and the cause of intestinal permeability. Once gluten is removed, the body is able to heal and regenerate itself. Infections have been implicated as triggers in many cases of autoimmunity, and identifying and removing infections may result in a complete remission of the autoimmune condition. Although we can’t always identify and even remove all of the triggers, such as Epstein-Barr Virus (the virus that causes Mono), another option is to fix the intestinal permeability. This will also allow many individuals to put their condition into remission, as the “three-legged stool” of autoimmunity will no longer be able to stand! Gluten sensitivity and Coeliac disease have been implicated in various autoimmune conditions ranging from Hashimoto’s, Graves’ disease and Rheumatoid Arthritis. Various tests can be done to determine if one has Celiac disease/gluten sensitivity. Gluten sensitivity may be the sole root cause, or it may be one of a few root causes. Every person with an autoimmune thyroid condition should remove gluten from his/her diet. Even in those who do not have Coeliac or gluten sensitivity, gluten may cause intestinal permeability. If gluten was the sole root cause, the person should see a complete remission of thyroid antibodies and thyroid function may even return to normal within 3-6 months. Treatment: Testing for Coeliac/gluten disease, and removing gluten from the diet. In addition to gluten sensitivity, individuals with Hashimoto’s may also be reactive to multiple other proteins including grains like rice, quinoa, and corn. Some experts, like Dr William Davis, author of Wheat Belly, claim that human beings did not evolve to eat “grasses” like wheat, rice or corn. ALCAT labs offer additional testing options for food sensitivities. Treatments of Choice: Testing, elimination diet, and in some cases a rotation diet may be beneficial. Working with a nutrition coach can be extremely beneficial in this respect. Supplements to help restore the gut lining may be beneficial as well. Zinc and glutamine are among the two substances that are required for rebuilding intestinal lining. In times of stress, the body will pull these substances from our intestines and uses them for other things, such as the production of adrenal hormones. In most cases, these substances become available to us through food, and things go back to normal after the stressful time is over, and the gut lining is rebuilt with new ingredients. This becomes an issue for those under prolonged stress, those with low stomach acid (which is needed to extract zinc from proteins), and those that follow a diet low in animal protein, including vegans and vegetarians, as glutamine is primarily found in animal protein (including eggs and dairy). Some individuals who followed vegan/vegetarian diets and then introduced animal proteins back into their diets have been able to put their Hashimoto’s in remission. I believe this is because the glutamine and other ingredients allowed them to rebuild their gut lining. A parasite found in the intestines can cause a tremendous amount of damage and has the ability to cause intestinal permeability, food sensitivities, and autoimmune disease. If you are someone who developed your condition after a period of intense stress, I urge you to get tested, as stress makes us more susceptible to parasites. Unfortunately, diets are a short-term fix. People with parasites have multiple food sensitivities that don’t go away no matter what they eat or don’t eat. A person may feel better initially after removing sensitising foods, only to start feeling worse once new foods become reactive. You can be on the perfect diet, and take loads of supplements, but if you have a parasite, it doesn’t matter; you will not be able to recover fully. There are many different types of parasites, including worms, amoebas, and protozoa. Temporary Fix: probiotics, low carbohydrate diets, and specific diets will make it easier for us to tolerate the parasite symptomatically, but will not result in the elimination of the parasite or the autoimmune condition. Solution: antiparasitic herbs tailored to the parasite, specific antiparasitic medications, certain supplements, the probiotic S. Bouladrii and low carbohydrate diets will help as well. SIBO is an overgrowth of bacteria in the small bowel or small intestine. This overgrowth can be caused by antibiotic overuse and starchy foods, among others. The SIBO results in intestinal permeability as the body tries to get rid of the excess bacteria. Treatment options: antibiotics, antimicrobial herbs, elemental diet and diets like the Specific Carbohydrate Diet, Low FODMAPS diet, and GAPS diet are the treatments of choice for SIBO. The fungus Candida can cause intestinal permeability and has been implicated in autoimmune disease and food sensitivities. Testing: Gut testing such as the GI Effects Profile may help determine if there is an overgrowth of Candida in the bowels. Treatment: Probiotics, anti-fungal herbs, and medications, an anti-candida diet. So what’s your root cause? Sategna-Guidetti C, Volta U, Ciacci C, Usai P, Carlino A, De Franceschi L, Camera A, Pelli A, Brossa C. Prevalence of thyroid disorders in untreated adult celiac disease patients and effect of gluten withdrawal: an Italian multicenter study. Am J Gastroenterol. 2001 Mar;96(3):751-7. Beginnings, July 31, 2015, P.15. Amino, N., “Autoimmunity and Hypothyroidism,” Baillieres Clin Endocrinol Metab. 1988 Aug;2(3):591-617. Clearfield, W., “Patient Mysteries: Are You Thyroid Deficient?,” Healthy Beginnings, August 31, 2015, P. 8. Hertoghe, Thierry, Reverse Physical Aging: Hormone & Nutritional Therapies, A4M Lecture Series, Las Vegas, NV, Dec. 14, 2014, p. 44. Reasoner, J., LeakyGut Syndrome in Plain English – and How to Fix It, http://scdlifestyle.com/2010/03/the-scd-diet-and-leaky-gut-syndrome/, Accessed September 6, 2015.